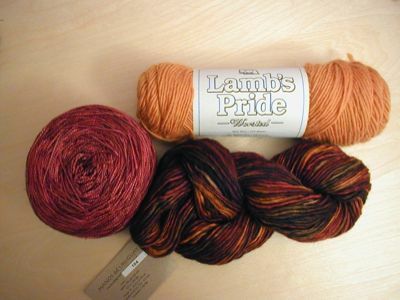 I flexed my new credit card and bought two skeins of Lamb’s Pride, two skeins of Manos, and a skein of Silken. 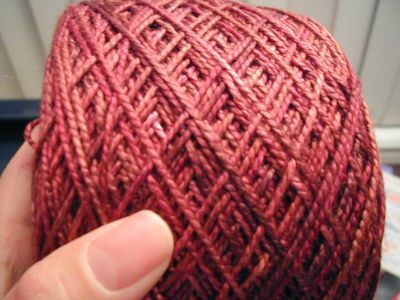 Technically, only the Silken is off my yarn diet, because the others are for my Tartan Jacket – I was tired of waiting for the other colours I needed, so I’m going to sub a double strand of the worsted and the manos. Top-down raglan may be flung aside again, but we’ll see. And really, who could resist the power of silken? Not me, apparently! 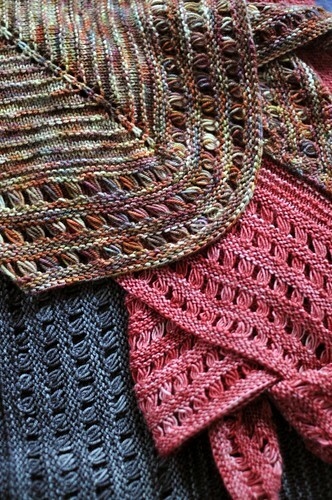 I’m’a gonna make Clapotis. This credit card thing could be very, very bad for my bank account – just look at the world of possiblities that have opened up to me! Applelaine has GORGEOUS handpainted silks (i’m such a sucker for silk), $35 for in-stock skeins (big skeins, like 300 yds) and $7 shipping anywhere in Canada. They’ve also got Koigu on sale for $11 (although I can see they’re having trouble getting good colourways too). I might actually have to get something from them. On the other end of the spectrum, there’s discountyarnsale.com which has the Cotton-Ease, Cotton Plus and even Lorna’s Laces! Shipping will be steep, though – does anyone want to order some stuff from them soonish? It might take some time to ship. Leslie? Joyce? Also, it won’t be as difficult to buy stuff from Elann (before I it took over a week to clear EFT from my chequing account), so that could certainly be balance-sucking. Sigh. So much yummy yarn, so little time (and money).